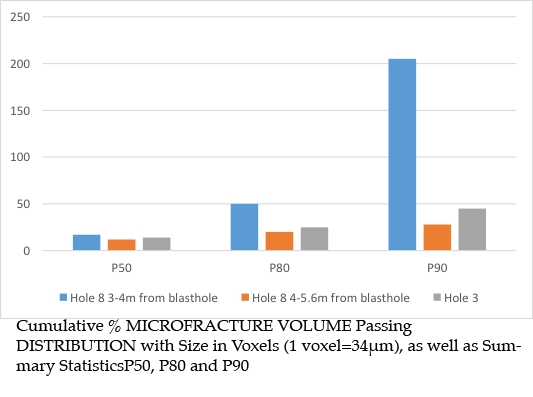 LABYRINTH® micro-scale damage (conditioning) quantification method was used to quantify the extent and degree of intact damage due to a fully confined blast hole. Using x-ray microtomography produced microfracture statistics from core samples taken before and after the blast, it was possible to delineate a blast damage radius. Over 40,000 microfractures, from 32 samples were analysed using LABYRINTH®. Provisional patent file number: 2015901392.
statistical methods used to quantify significant levels of blast damage preconditioning within 3-4m of the blast hole.